Before we dive in, I want to share some of the sources I’ve used to learn fitting. Additionally, Threads Magazine also offers a DVD from Sarah Veblen where she covers much the same ground as in the Pattern Review bodice fitting class. I have this DVD and appreciate it, not only for the superior production quality, but also because it covers fitting garments with princess seams. I should note that Threads Magazine no longer carries this DVD in their online store, and as I write this Amazon has one copy in stock. Also, the courses I have taken in fashion draping – both informally with Paul Gallo at Sips n Sews, and in a classroom setting from Judy Jackson, at City College of San Francisco, have helped me improve my fitting skills considerably. All mistakes are mine, not theirs! Muslin A was the was the original Chambray Shirt I made some time ago. This is Kwik Sew 2000, with the neckline enlarged and few if any other alterations to the pattern. Kwik Sew 2000 is a relaxed fit sport shirt pattern, with a boxy silhouette. It would be a good starting point for a shirtjacket project. In this case, I’m using it as a starting point for a dress shirt block. Seeing this shirt on the “client” today made me think I can do better. The arm holes are out of place. The back view shows this well, with the armscye falling a bit off the shoulder point, and fabric pooling in the underarm area. The neckline is also out of place. It sits too far back on the body, so there is a gap between the neck and collar at back. I began by scanning the Kwik Sew pattern into the computer, and tracing it into Wild Ginger’s PatternMaster software. I’ve written some articles during my pants fitting debacle that explain my workflow with this software: they are collected under the tag ‘wild-ginger’ on the blog. These days, I’m equally comfortable doing pattern work with pencil and paper, or digitally with the computer. Some things I prefer doing with pencil and paper – for instance, I appreciate the freedom of using a french curve and a pencil to draw out a clean looking curve. Whereas the curve tools in the pattern software can be clunky to use and give me an uneven curve I often end up cleaning up with a pencil once it is printed. 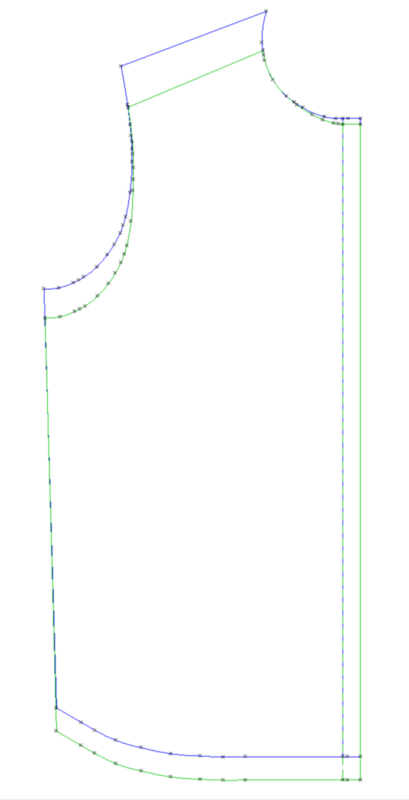 Pattern drafting software, on the other hand, makes tedious tasks like adding seam allowances easy to do. And it can work with precision impossible with pencil and paper. 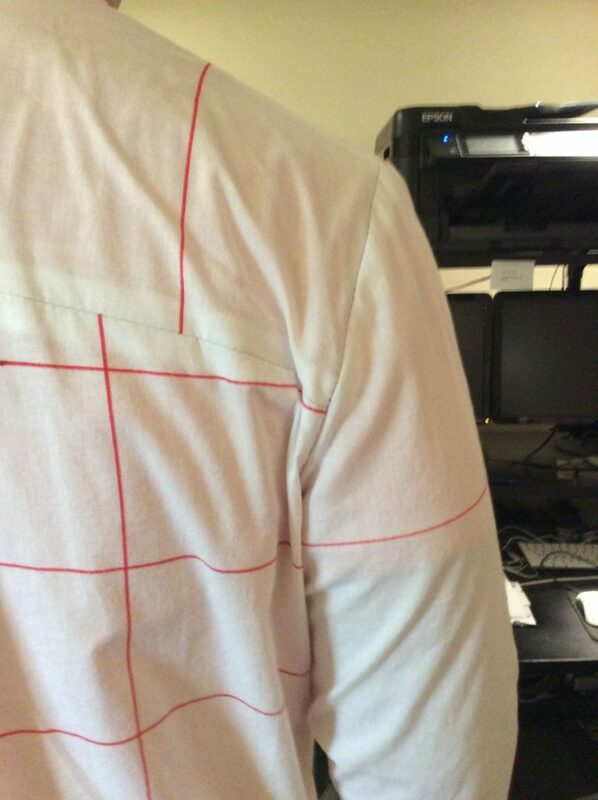 Since I planned several revisions of the shirt pattern, working digitally allows me to do two things: (a) avoid inaccuracy that creeps in through repeated hand alteration and tracing of the pattern, and (b) gives me a history trail of the changes I’ve made to the pattern. I scanned in the pattern and made just the length changes on the computer, since those are pretty simple to do. 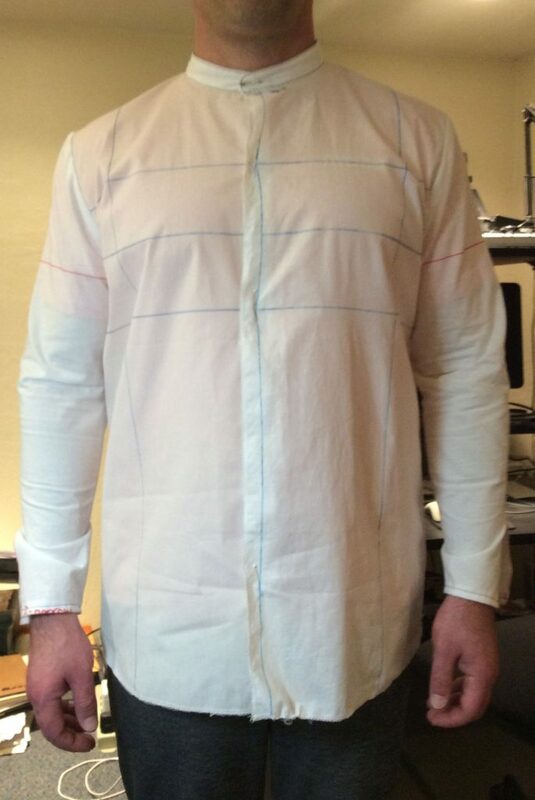 Then I printed the pattern, and made a muslin with just the front, back and yoke pieces. I placed this on the client, then drew in dotted lines where I wanted the armscye and necklines to go, using a sharpie. 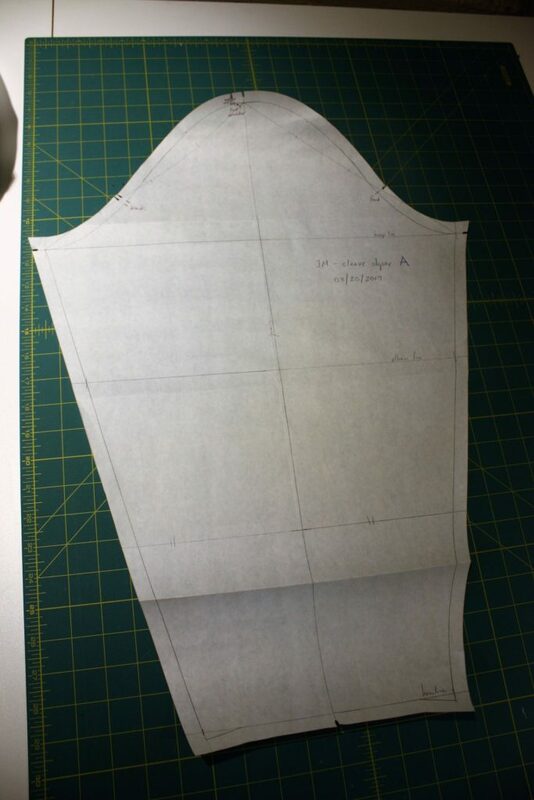 I disassembled the muslin, and on the fabric drew in cleaner curves using the fashion ruler. I scanned the muslin back into the computer and traced over the curves in Pattern Master to produce Muslin B. Here’s the scan of the muslin, with the lines draped in. The new armscye and neckline were an improvement, but new problems were uncovered in this fitting. 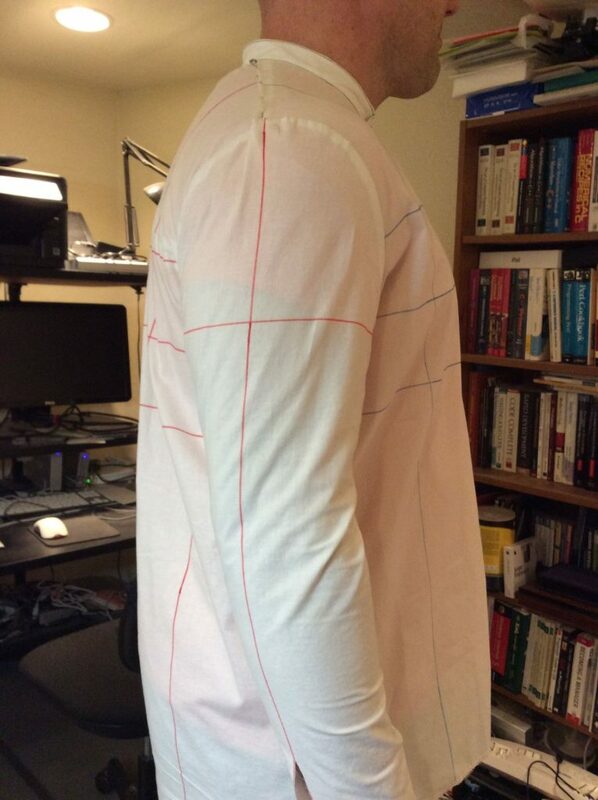 The armscye is much closer to ideal, but there is still too much fabric gathering, especially in the back. The fit through the chest is too tight. There’s not enough circumference in that area. Front/back balance is off, as viewed from the side. Balance is a really important issue when fitting any garment, so I wanted to take a moment to discuss it here. 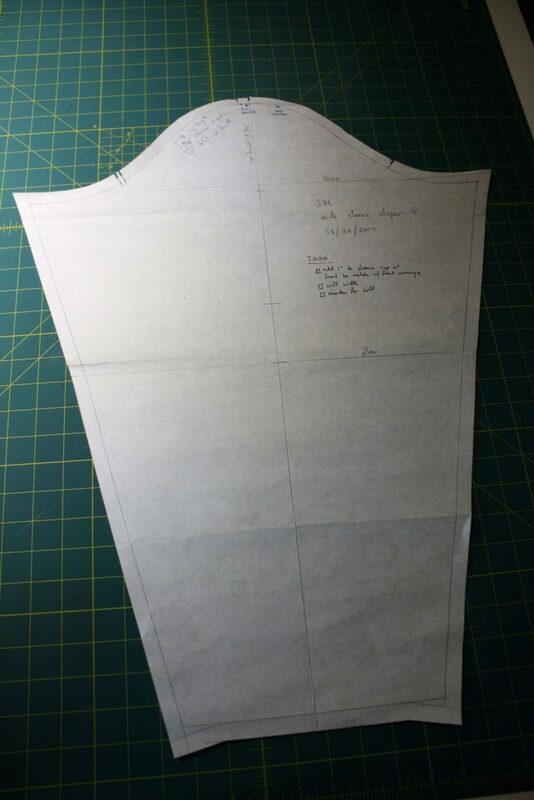 In a fashion draping class, you are taught first thing to pencil-mark lines for the fabric grain and crossgrain before placing fabric on the dress form. This is because the alignment of the grain greatly affects the way a garment hangs, and consequently how the garment fits. Generally, you want the grainline to follow gravity straight up and down, and the crossgrain to lie parallel to the floor. (In draping, you sometimes let the crossgrain go off parallel to the floor to achieve various design effects, but that’s outside the scope of this discussion). In this fitting photo, the crossgrain tips upwards in the front, and tips downwards in back rather than hanging level with the floor. This causes the fabric to hang off-grain – which in turn causes wrinkles and folds, rather than a shirt that hangs smoothly on the body. You can see that in this picture, with the vertical drag lines in the back, that start from the shoulder area and extend downward. It’s usually best to get the garment to come into balance as soon as you can in the fitting process, because it can mask other fitting issues – and because you may “fix” a specific fitting issue that is actually an overall balance issue. In this particular case, there are two ways we can bring the shirt into balance. 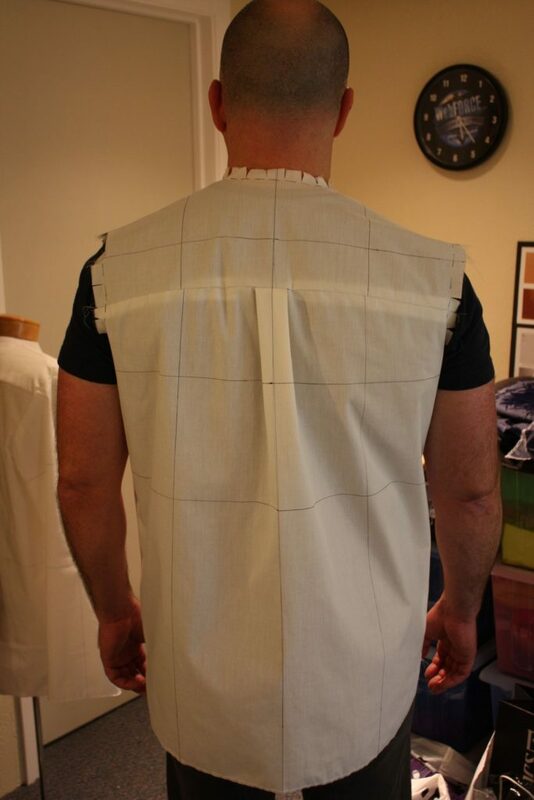 We can remove fabric from the upper area of the back piece, or we can add fabric to the upper area of the front. I chose to take away from the back. I revised the armscye with another drape, drawing in curves on the client again. This took in the armscye a little more. I added 1/4 inch at the side seam to provide ease through the chest area. I added 1/2 inch at center front, again to provide ease through the chest area. To fix the balance, I took a 1 1/2 inch tuck through the back armscye to raise the upper back and get the cross grain to balance. In this scan of the back piece, rows of red and green dots mark where I pinned out the fabric on the client, and the horizontal pink lines are the cleaned up version. This screen capture from Pattern Master shows the alteration. Muslin B is red, Muslin C is in blue. Taking the tuck in back has raised the back armhole. 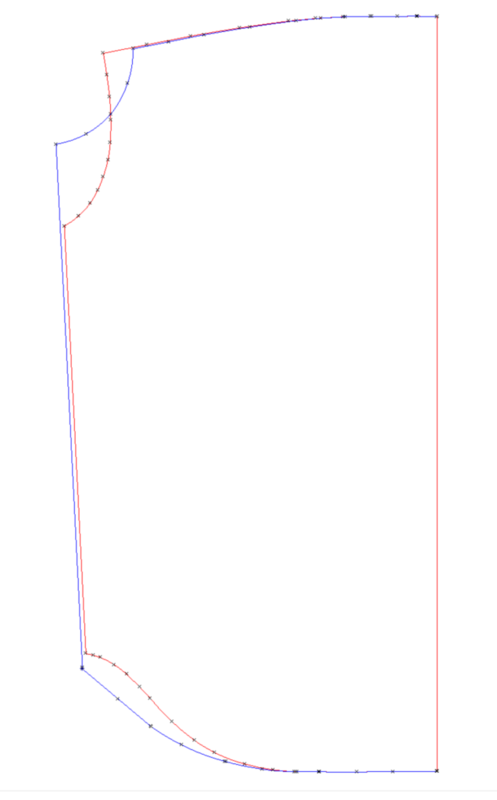 (The curve is also a bit steeper because I redraped it). Also, I added to the bottom of the shirttail in Muslin C to keep the overall length the same as before. 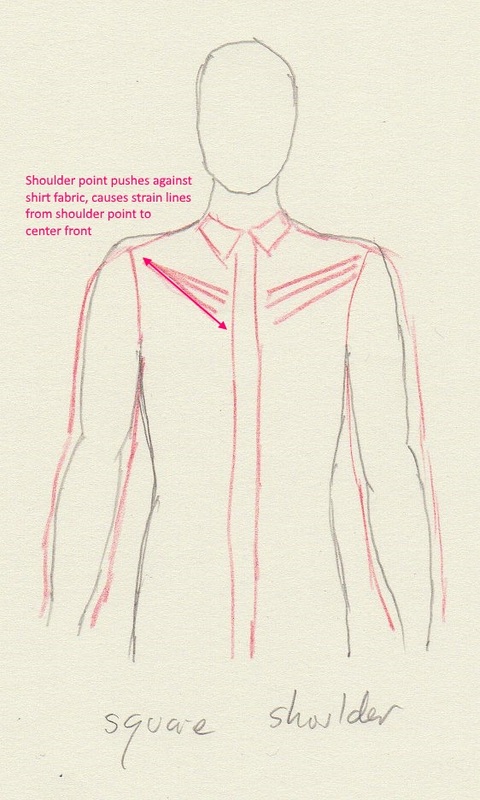 To check the neckline fit, I drafted a mandarin collar. 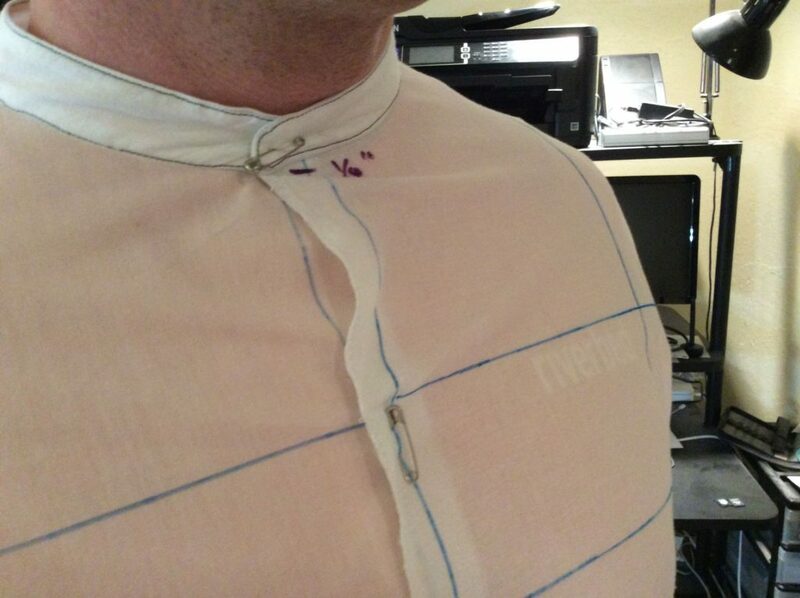 Just the collar band should be enough to see if the neckline is in the right place, and is too loose or two tight. Since the horizontal tuck in back alters (and shortens) the armholes, I threw out the sleeve that came with the pattern. Instead of trying to adjust the pre-provided sleeve, I prepared a sleeve draft from scratch. I tried two variants. One had a high sleeve cap, the other a flatter sleeve cap. The flatter sleeve cap has more ease through the bicep area, and will be more comfortable, but it will show more wrinkles than the high sleeve cap version. I drafted the sleeves with pencil and paper, easier than using the computer. Muslin C exposed some issues I should have caught earlier in the process. 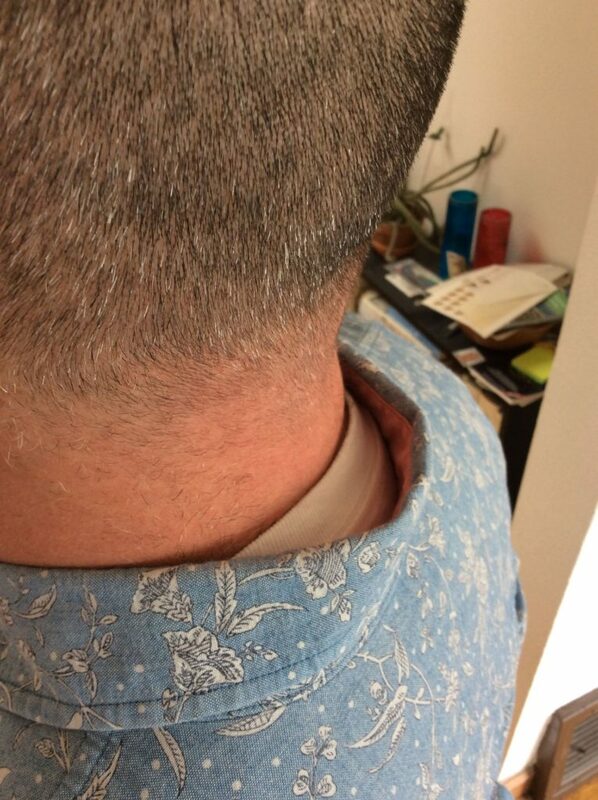 There are visible wrinkles radiating from the high shoulder point (where shoulder meets the neck) to the underarm area. You can spot this in both the back and front shots. This is because of excess fabric in the low shoulder point, and means a slight sloping shoulder adjustment is necessary. This is something I did notice in Muslin B, but at that point I wasn’t sure if the problem was the shoulder slope or the armholes. Now that I have a better handle on the armholes, the shoulder slope is the likely culprit. These two diagrams show the effect that shoulder slope has on fit. In this first diagram, the person (in pencil outline) has shoulders that slope downward more steeply than the shirt (in blue) he is wearing. Two things happen: there is excess fabric at the shoulder point, or hinge where shoulder meets the arm. This causes the fabric to sag, but also causes tension in a different direction: the line from high shoulder point running down towards the underarm area. That tension causes drag lines to form. In the second diagram, the person has square shoulders that slope less steeply than the shirt (in red) he is wearing. I drew the body outline outside of the shirt, but what I’m trying to illustrate is that the body is a little higher than the shirt in that area, and pushes against that corner of the shirt. This creates a line of tension running from the shoulder point (where shoulder meets the arm), downwards to center front, causing a line of different set of drag lines. These run perpendicular to the sloped-shoulder case. 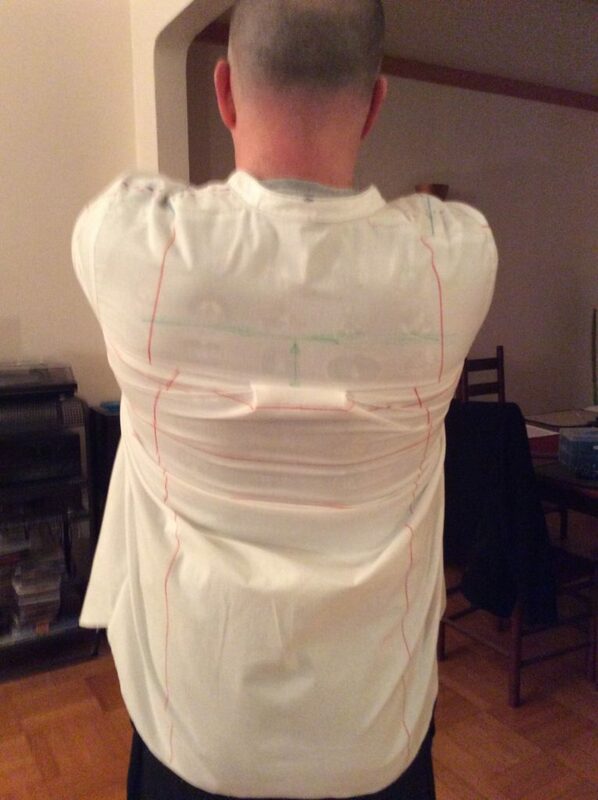 While fitting myself, I had to correct for my own square shoulders. 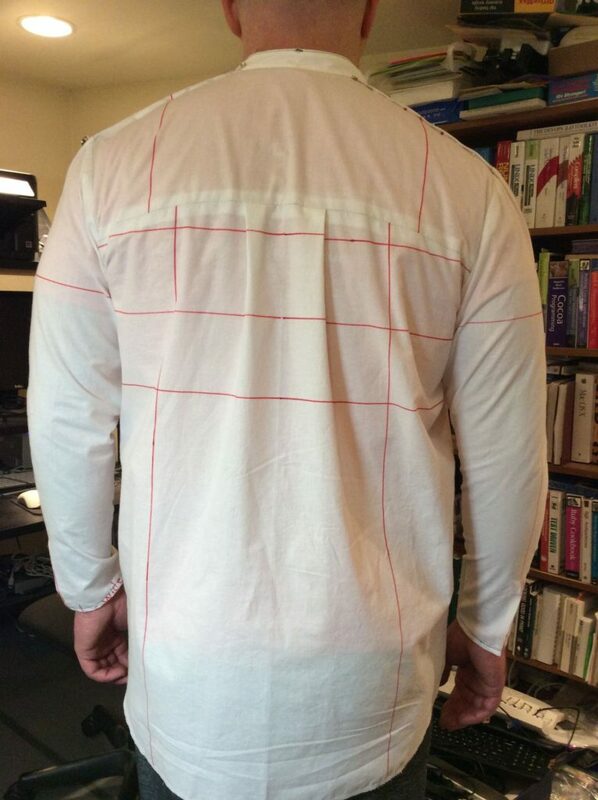 For this client, I have to drop the shoulder point on the pattern slightly to get the shirt’s slope to match the body. The front/back balance on the shirt is still off. The side view shows this problem. The crossgrain on the front piece still tips upwards, and again vertical drag lines appear in front from off-grain fabric hanging in gravity. 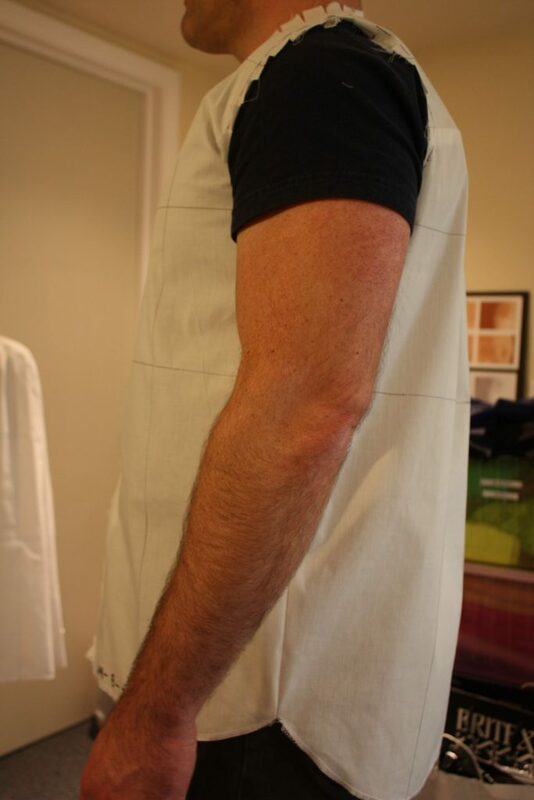 The shoulder seam now sits too far back on the client. It should run across the apex of the shoulder, but it’s sitting behind the neck. You can see this in the side view above. The back yoke seam is too low, which prevents the box pleat from opening between the shoulder blades and inhibits mobility. This was a problem with the original Kwik Sew pattern, but taking the tuck in back pulled the yoke seam even lower and made the problem worse. These types of secondary fitting issues are a reason why it’s a good idea to get the garment balanced as soon as you can in the fitting process. The flatter/wider sleeve cap won this bakeoff, but it is still lacking ease through the bicep. It also lacks forward reach mobility. And when the client raises their arms, the whole side seam comes up. 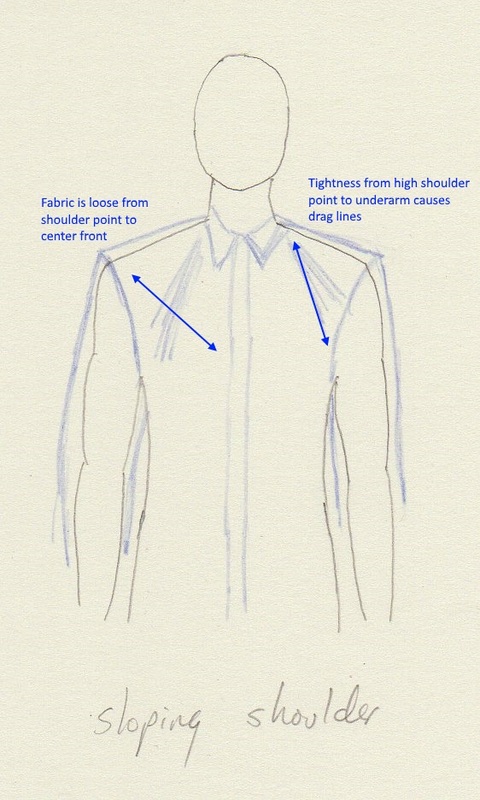 The neckline is too tight – it is hard to get the collar buttoned. It looks tight in front. In retrospect, I see this as another problem caused by taking that back tuck, which pulled everything in the front of the shirt backwards. In retrospect, it would have been better if I had corrected the balance by adding to the front and taking a tuck in back at the same time. Also I should have made that adjustment before attempting to drape new armholes and necklines. As this fitting drama plays out, you’ll see how I could have saved myself work by getting the balance established first. 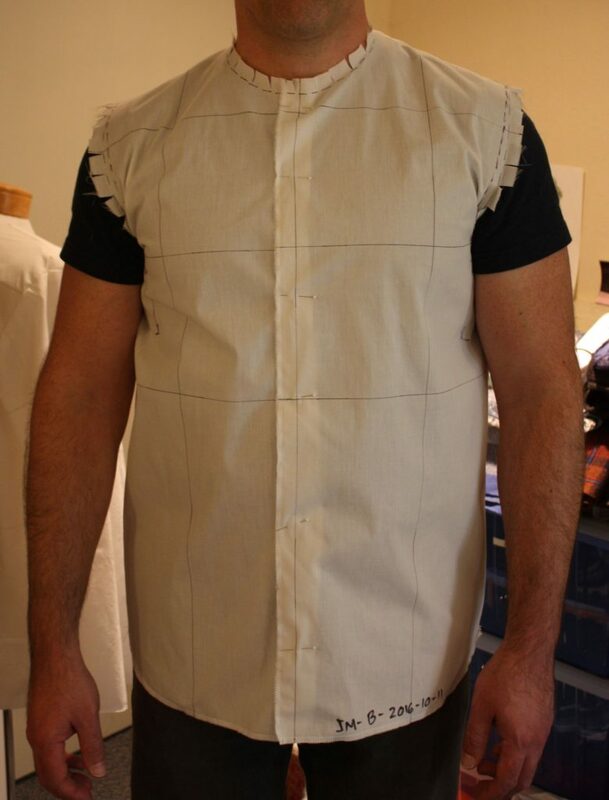 Here are the changes I made going into Muslin D.
Sloping shoulder adjustment. Lowered the shoulder point by 1/4 inch, with a corresponding drop in the underarm point. I added 1 inch vertically, across the front in the armscye region, to correct front/back balance. Since I took away from the back last time, I decided to add to the front this time. Also, on this muslin the biggest tilt of the crossgrain line is still in the front. 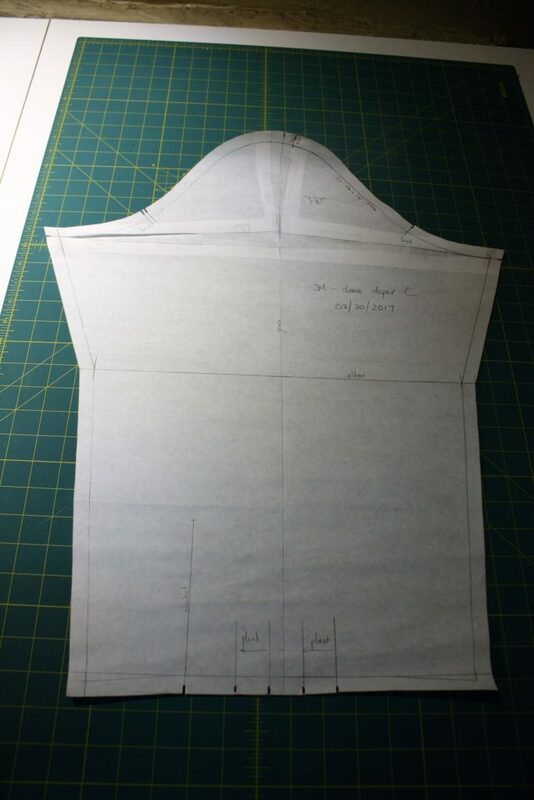 Move the shoulder seam forward 1 1/2 inches, to get it to sit at the top of the shoulder. Drop the front neckline by 1/4″ to address the tight neckline in front. 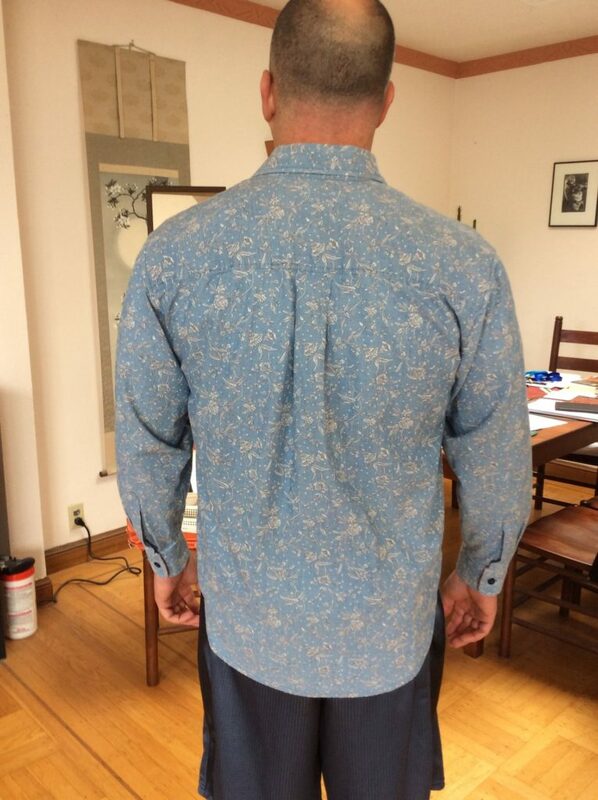 This screen capture shows the cumulative effect of these four changes on the pattern piece for the shirt front. Muslin C is blue, Muslin D is green. The shoulder seam in D is lower because I moved it forward, giving the excess to the yoke piece. If you look carefully, you will see that the green shoulder seam is slightly more sloped than the blue seam. 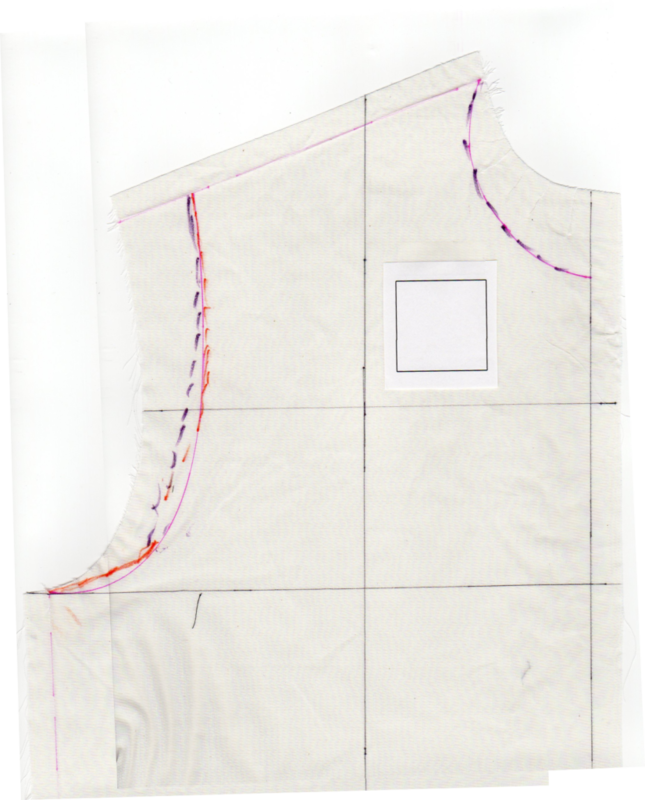 Adding a 1 inch tuck across the front of the piece lengthens the front armhole, and lowers the armhole curve by an inch. Finally, the neckline is dropped by 1/4 inch in front. Raise the back yoke seam 1 1/2″ to better place the box pleat and help with forward reach. Because I added 1 inch to the armscye in front, I also needed to add 1 inch at the top of the sleeve cap to keep the cap the same same length as the armhole it sews into. Working in paper, I slashed at the top of the sleeve cap, and pivoted outwards to create a 1 inch gap at the top of the sleeve, and filled it in with paper. Looking ahead to the day when the sleeve is sewn into a real shirt, I placed and adjust the placket opening on the sleeve. I also added barrel cuffs to the sleeve. 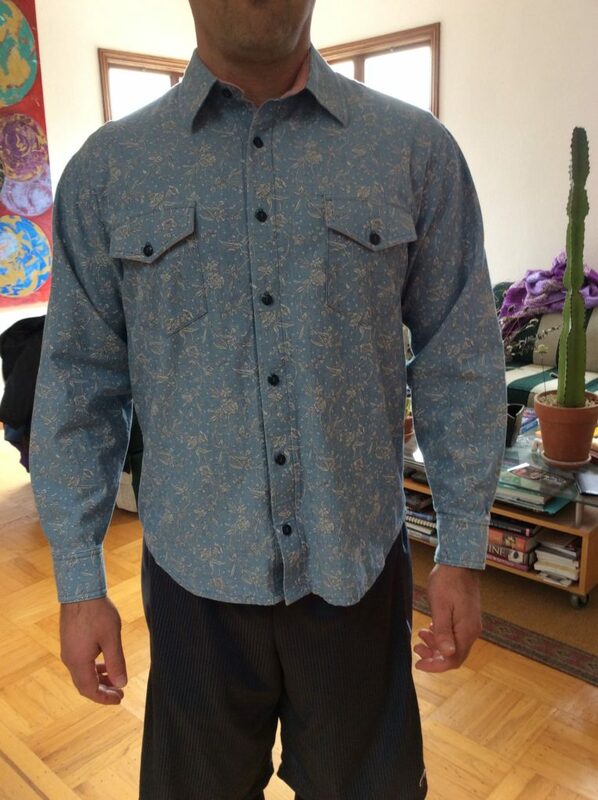 The cuff sizing was sampled from an existing shirt the client was happy with. The situation looks dire now, largely to the horizontal tucks I took in order to balance the body of the garment. But we’ll see how this round of pattern updates has affected the fit. I really appreciate all the pictures & clear descriptions. I always learn a lot from your posts. Dedicated and determined you are, Michael. The buzz cut and biceps proved a bit distracting for a knowledge seeker, such as myself (as you know, I’m typically all about the process, not the people). Your missteps are informative and appreciated. Looking very much forward to seeing your triumph, and his try-on. Thank you – at the risk of making myself look like a fool, I wanted to show the process as I experienced it, missteps and all. There’s lessons to be learned there. Thanks for asking this question – it’s one I had myself when I started with Sarah Veblen’s fitting methodology. I think my full thoughts on the subject are probably too big for the scope of a blog comment. I’d rather include it as part of a blog post, so I promise to tackle this issue head-on in the next article in the series.